This year, I gave my mom and sister makeup baskets for Christmas. They were so much fun to make, that I thought I would share this cute gift idea with all my chickadees! Since I had no idea what makeup colors they might like, I decided to fill their baskets with tools and applicators. There are soooo many types to choose from that I didn't have a hard time filling the baskets at all. I knew my sister wanted some makeup brushes, so my first stop was the MAC counter at Nordstrom to pick up a set of the brushes my favorite youtube beauty gurus are always raving about: the 217 and 219 eye brushes. 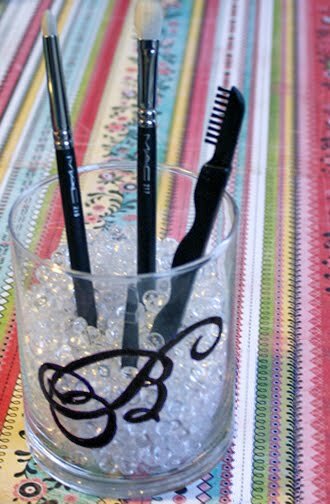 I didn't want to just give them a couple brushes, so I stole an idea from Sephora (and youtube beauty guru, Koren at Enkore Beauty) and made my sister and mom their very own brush holders. You can find the tutorial here. Next, I hit sephora.com and picked out some fun little makeup tools that make awesome stocking stuffers. Since I bought the brushes, I thought brush shampoo was a must, so I picked Sephora's travel size version. 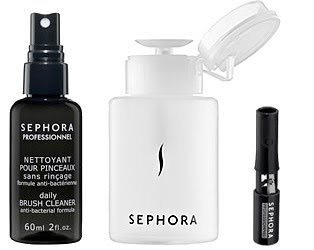 I also ordered a couple of these great liquid dispensers which they use at Sephora with their makeup remover where they have the little tester brushes and cotton balls on the end of the aisles (you know what I'm talking about). I think it's so cool, because you are less likely to spill your makeup remover or expensive toner and it's cuter than an ugly nail polish remover bottle sitting on your vanity. Another little Sephora gadget that I love is the cute in-cap sharpener in the photo above that fits onto your eye or lip pencil! It's so clever because you can toss the cap that comes with your pencil and replace it with the sharpener and it will never get lost! It has a little cap so you don't end up with shavings all over your makeup case and they are really inexpensive, so you can buy one for each of your pencils. I've had my eye on the Sephora refillable lipstick palette forever, so I bought a couple of them thinking it would be totally fun to spend an afternoon making our own palettes! (I'll do a special post on that later. 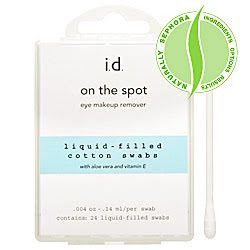 Another little goody I added are these makeup remover cotton swabs. Made by Bare Escentuals, they are filled with liquid makeup remover and come in a little plastic case that you can toss in your purse for mid-day touch-ups. In addition to Sephora, I checked out ulta.com and picked a couple more makeup pressies. This cute mini tweezer and brow gel set by Ulta grabbed my eye. I just love miniature stuff! I also found this folding brow and lash comb tool also by Ulta. The metal lash comb teeth are really thin so they separate your lashes much better than those crummy plastic ones. So, there it is! The perfect makeup gift set that you can customize for your girlfriends, moms and sisters no matter what kind of cosmetics they use. Hi, chickadees! I'm Melissa, a graphic designer and artist, married with 2 doggies, native Texan, "grown up" sorority girl who loves to bake and make things pretty. Please check out my etsy shop and have a silly day! I love sharing ideas and am thrilled to be featured on other blogs! You're welcome to use any photos on Silly Bee's Chickadees as long as you link the photos back to the original post on my blog. Thanks! The legal stuff: This work by Silly Bee's Chickadees and Melissa Garza-Allen is protected under a Creative Commons Attribution-Noncommercial-No Derivative Works 3.0 United States license. Whew!